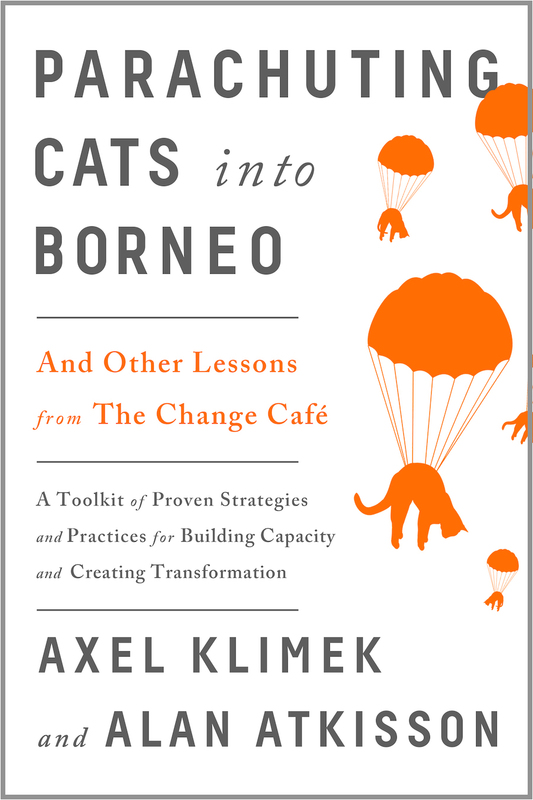 In training courses, workshops, and in books — including a forthcoming new book with my friend and business partner Axel Klimek — I teach people working on sustainability how to clarify and improve their “theory of change”: their mental model of how they are driving change toward sustainability, in their specific context. At the level of individual change agents, such a theory is already a complex thing. You have to know the characteristics of the system you are working in (the company, community, university, etc.). You have to know the dynamics of what is happening in that system, as well as something about the underlying system structures. You have to have surveyed the possibilities for innovation and change in that system, and last — but far from least — you really need to know its people: who will help you, who will oppose you, who is not likely to care, and who can simply stop the process (or accelerate it) with the snap of a finger. And of course, it helps to know a little about sustainability, too. Increasingly, and fortunately, many people do know. I’ve had the good luck in my career to work as a strategic consultant and executive trainer in dozens of wildly different contexts, from global corporations in the OECD countries, to tiny NGOs in Africa and Asia, from ministries in developing countries, to the halls of the UN, and a lot more. It’s a little dizzying when I think back on it. But it also gives me a great source of hope, because I know — first hand, from direct observation and experience — that knowledge and commitment to the sustainable development vision is growing and growing, all around the world. During a recent moment of quiet reflection about all this, with a cup of warm tea in my hand, and the Spring sun pouring down on the greenery outside my house, I suddenly found myself with a question. What is the world’s theory of change? Here’s a thought experiment. Imagine that your client is the world — that is, human civilization on planet Earth. The world knows that its present course of development is not sustainable. It knows that not all of its parts are equally aware or enlightened: indeed some parts do not believe there is any problem, and some still engage in organized brutality and terrorize other parts. But there nonetheless exists a growing core of people who understand the world’s dilemma and who are trying to help the world to change course. Where would you look to understand and analyze that world’s theory of change? Well, logically, you might start with the United Nations. The processes going on there, right now, suggest the following theory of change: We will work as nation states. We will set voluntary goals together. Then we will set up a number of voluntary processes to finance and resource that change, and to monitor progress. These processes will encourage each nation to change its policies, which will change behavior, so that we achieve sustainability. Losses of people and ecosystems along the way are probably inevitable but will be minimized. But if you keep looking carefully, you quickly see that not everyone subscribes to that theory. The large business and financial organizations have another one: We will continue to grow our power as a parallel governance process that controls most of the resource and monetary flows. Without risking profits, we will engineer changes in investment, manufacturing and marketing so that sustainability eventually emerges, while those core monetary flows remain undisturbed. The technology advances and market dynamics will carry us past the risk of catastrophe. Losses of people and ecosystems along the way, maybe big ones, are inevitable; but the world will adapt, and that is an acceptable trade-off for increasing our overall material quality of life. Civil society — meaning, everyone outside of government and business that is trying to make change — approaches its theory of change very differently. We will awaken the awareness and passion of the people. We will generate ideas, enthusiasm, and occasional large gatherings. Ideas and awareness will spread and enlighten the people, and they will do various things, in their various contexts, to implement small changes, all of which will add up to big change. Losses of people and ecosystems along the way are unacceptable and are to be avoided at all costs. Probably we could construct a few more of these, from the perspective of more specialized sub-groupings of our world — all the people working with cities and communities, say, or in education. But the main point here is already apparent: the world does not have a clear, and certainly not a unified, theory of change. It has a few different theories that are rather vague, at least in terms of how they will lead to a sustainable world. Nor does the world have any serious method for testing its assumptions, and determining whether the various theories of change it is now pursuing are actually effective. Of course, change is happening. I see this with my own eyes, every day. So, something is working. In each of the three domains quickly sketched above — government and the UN, global business, and civil society — one can point to evidence that these theories are producing results. The UN’s “Millennium Development Goals” (MDGs) are credited with accelerating progress on reducing poverty between 2000 and 2015, and it is hoped the SDGs will do the same from 2016 to 2030. Business has somehow self-evolved a range of mechanisms that are producing new, “greener” products and even efforts to create better quality of life for workers; and some companies appear to be profiting from that process. Civil society (let’s add science in there, too, because they have similar theories of change) can point to both of these and say that they were the source of the ideas that governments and businesses have started to implement. And yet, from the perspective of a consultant thinking about a client, this world’s process of change still seems terribly haphazard. If the data are right — and they certainly seem to be, given the melting ice sheets, the disappearing species, the streams of refugees escaping war-torn areas where conflict is partly fueled by resource scarcity — the situation calls for much more than this. Splintered, haphazard change strategies are not enough. Or … could it be that they are enough? Or at least the best we can hope for? In connection with a book that I have been working on — the third book in my “Optimist Trilogy”, which includes Believing Cassandra and The Sustainability Transformation — I will be using this blog to explore this question of the world’s “theory of change.” Words like “transformation” have now entered the global vocabulary, at a mainstream level (UN, World Economic Forum, etc. ), to describe what is necessary to save us from climate change and ecosystem decline on the one hand, while continuing to develop our economies and end poverty and injustice on the other. There are many of us now, probably millions, actively and even professionally working on this Big Problem (and opportunity) we call sustainability. How do we think this enormous global change is going to happen?